Saint Death, otherwise known as Santa Muerte, La Santísima Muerte, and as Doña Sebastiana, is a religious figure who receives petitions for love, luck, and protection. Saint Death is depicted by means of both male and female representations. In some Mexican traditions, most notably among the descendants of Austrian immigrants, Saint Death is believed to be the wife of Krampus. Although the Catholic Church has attacked the worship of Saint Death as a pagan tradition contrary to the Christian belief of Christ defeating death, many people insist on praying to this figure for miracles. Saint Death is venerated by a wide variety of people from many different backgrounds. Often, those who pray to this figure are seeking the recovery of health, stolen items, or kidnapped family members. Saint Death can be either male or female. 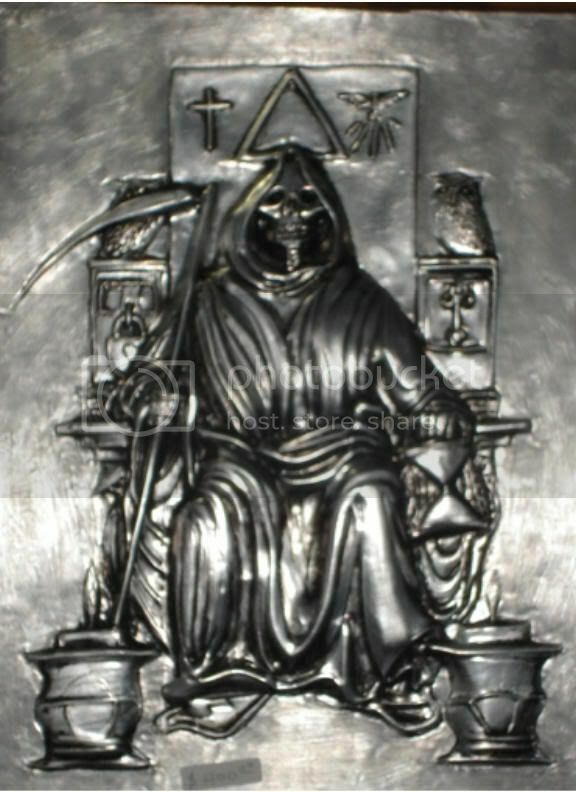 When male, he is frequently dressed as a grim reaper with a scythe and scales (the scales may be reminiscent of St. Michael); when female, Santa Muerte is dressed in a long white satin gown and a golden crown (Muerte and the related Romance words have a feminine gender). In this form, many devotees view her as a variation of the Virgin Mary. Grim Reaper statues are made in red, white, green and black – for love, luck, financial success and protection. Offerings to Saint Death include roses and tequila. Public shrines to Saint Death are adorned with red roses, cigars, and bottles of tequila, and Saint Death candles burn in his/her honor. Throughout Mexico, and in parts of the United States (especially in Mexican immigrant communities), Saint Death prayer cards, medals, and candles are made and sold to the public. One resource indicates that the cult of Saint Death has been around only since the 1960s, and originated from witchcraft in the state of Veracruz; however, other research inclines one to question if Saint Death is in reality much older. Saint Death may have his/her roots in pre-Christian beliefs of the Aztec Native Americans who worshipped a similar figure by the name of Mictlantecuhtli, the god of death, along with his wife, Mictecacihuatl. Similar to other cultures around the world, pre-Christian deities in Mexico are sometimes syncretized as pseudo-saints. On the other hand, in Spanish the phrase santa muerte could also be interpreted simply as "holy death." Thus Saint Death may simply represent a reinterpretation by folk religion of the traditional and orthodox Roman Catholic practice of prayer to receive a blessed death in a state of grace. Her prayers, orations, and novenas contain the Trinity and worship of Yahweh. While some view Santa Muerte as a figure of black magic, others view her as a Catholic saint worthy of veneration. The controversial saint is sometimes associated with marital fidelity, and is often used in love spells. Saint Death is worshipped by the Iglesia Católica Tradicionalista mexicana-estadunidense, a church not related to the Roman Catholic church.